I visited H&M showroom in London to see Maison Martin Margiela x H&M collection and take some pictures of my favourite pieces. 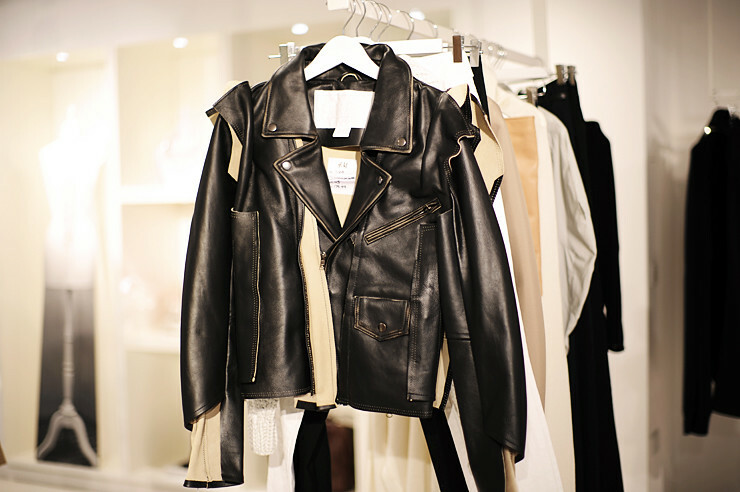 My eyes are always focused on the leather jackets, because finding a perfect one is not a piece of cake. This Margiela jacket is absolutely amazing. I’m also delighted with the silver ‘heavy’ jewellery and the mirror ball leggings which in my opinion will be a bestseller. Apart from that I had a chance to try the body with integrated bra on and take some pictures on the roof with the amazing view of London – see it here. The body is my number one of the collection. Great pictures and even better clothes! Pokazałaś przyjazną strone tej kolekcji MMM. Bo jak widze te kołdry i spodnie oversize [to mało powiedziane], to dziękuję. Fajna zabawa modą, duża innowacja, to doceniam. ALe na co dzień nie bardzo. Chyba że dla fashion victims. wow, the collection looks stunning, really high quality, excited to see the full collection! Great pieces. Those leggings are gorgeous. Sadly we probably will not be getting the collection at my local H&M. i saw the collection and i want it all! I’m very angry . why don’t write in Polish ?? please visit my blog ;), i’ve just started blogin’ but i really like it, you have to see this ;)! świetne rzeczy. zdjęcie na dachu cudo. ta kurtka z pierwszego zdjęcia jest zdecydowanie najlepsza. i N E E D that jacket! what r u exactly doin in Lnd? ohmy – this leather jacket is so rad! Alice napisz co robisz w Londynie, studiujesz coś, pracujesz? This jacket is really amazing … I need one! legginsy! szkoda ze więcej zdjęc nie dałaś! Now I am very excited!! I am going to the event in Montreal and it looks so nice!! No niestety – jak inne kolekcje powstałe ze współpracy projektantów z h&m podobały mi się bardzo, to w tej jest tylko kilka elementów które przypadły mi do gustu, m.in. buty, torebki, a reszta może fajnie wygląda na zdjęciach, ale moim zdaniem kompletnie nie nadaje się do codziennego noszenia. Saw you accidentally in Westfield now , can I take a picture with you ? Saw you in Westfield a couple of minutes ago !! Can I take a picture with you ? MAISON MARTIN MARGIELA is one of the most important and influential fashion houses of the past three decades. I am always so excited about this.Thanks for updating. I have to say that I don’t like it at all… 🙁 Just the shoes and the candy bag. I’ve got to get that jacket! Some lovely pieces, your so lucky you got to go along. Love love love those clothes!!! Hmm biżuteria wydaje się ok.. jednak znając życie jakoś owych ciuchów niestety będzie bardzo kiepska..
That collection is amaaazing, Can’t wait for it to thit the stores! Agree – ADORE that jacket and i literally cant contain my excitement for the launch of this collection!